A crisp December 29th arrived with fresh westerly winds driving breakers onto the bayside shore of Cape Cod. Wind direction suggested any cold-stunned sea turtles that might remain in Cape Cod Bay would wash up on the high tide wrack line of west facing beaches from Orleans to Truro. 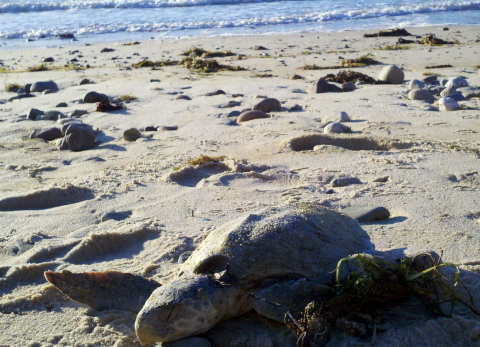 The Turtle Journal team decided to patrol the sandy bayside shore from Great Island in Wellfleet to Fisher Beach in south Truro. 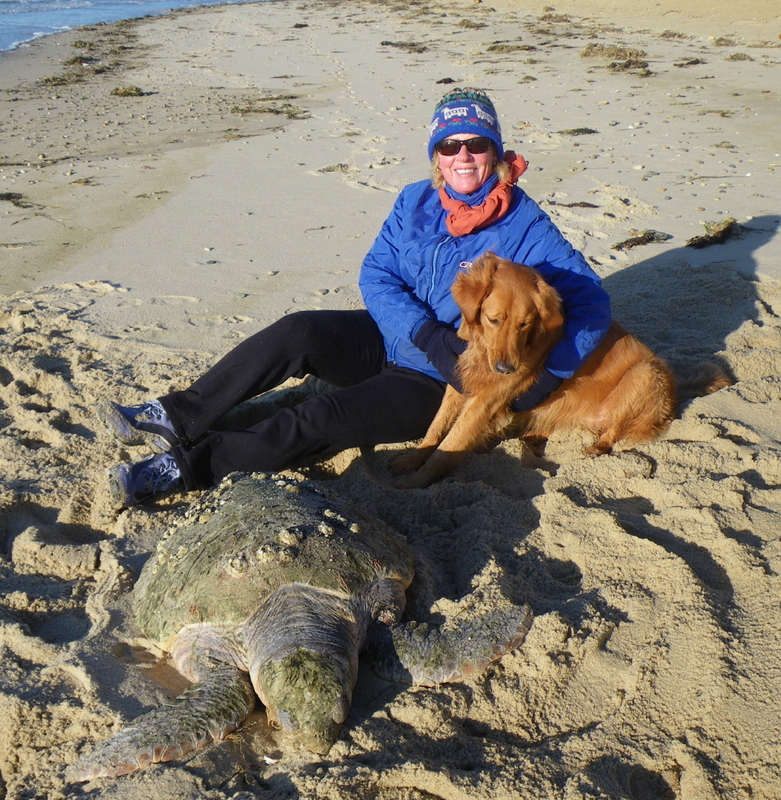 As Sue Wieber Nourse walked the stretch from Duck Harbor to Ryder Beach, she discovered a very large cold-stunned loggerhead sea turtle (Caretta caretta) that had been deposited during the early morning high tide. Easily identified by its massive neck and head that helped name this turtle after the enormous logger cleats of whaling boats, this juvenile loggerhead weighed in the range of 80 to 95 pounds. 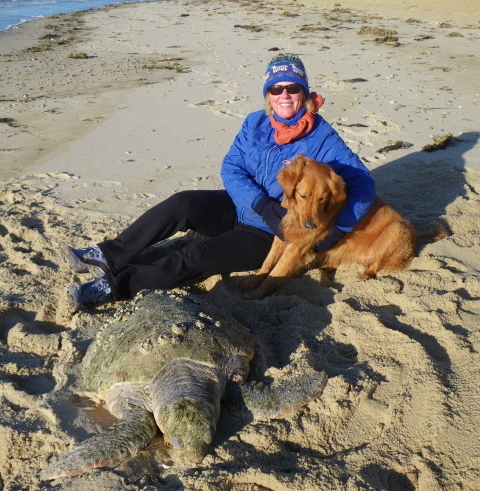 Sue and Rufus sit beside the cold-stunned sea turtle to give a sense of perspective of its size, as we waited for a sled to drag her off the beach. 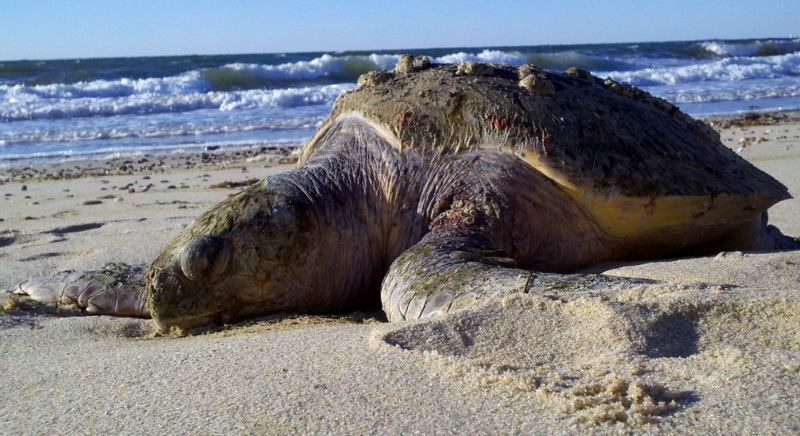 Loggerheads often arrive on Cape Cod with a dense epibiotic community of fauna and flora. 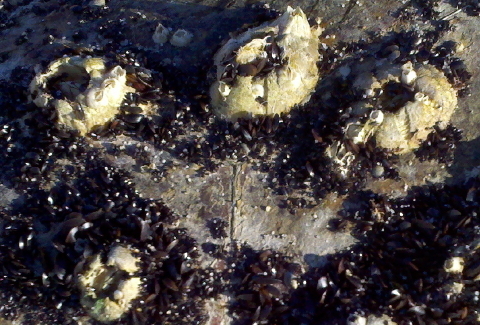 This one was no exception with large and small barnacles, as well as a dense layer of mussels. About 50 feet to the south, a small, roughly 5 pound Kemp’s ridley (Lepidochelys kempii) had washed up higher on the wrack line. Less than a foot long and probably about 2 years old, this turtle had traveled from the Gulf of Mexico through the Gulf Stream in Sargasso mats to end up trapped in Cape Cod Bay by dropping fall temperatures. 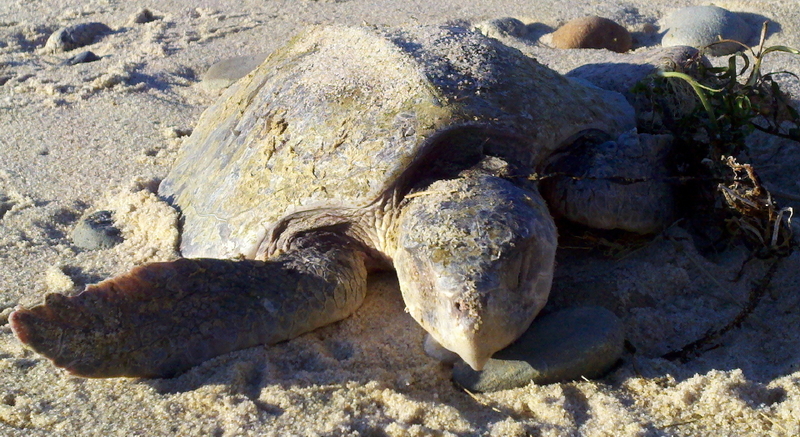 Kemp’s ridleys, although arguably the most endangered of sea turtles, comprise the largest percentage of Cape Cod sea turtle strandings each fall, usually as high as 90%. The second largest number of cold-stunned strandings has historically been loggerheads. But during the last decade, green sea turtles (Chelonia mydas) have seesawed with loggerheads for the dubious honor. We suspect this situation indicates loggerheads have been doing poorly and greens have been faring a little better of late. Americans can take the blame for the tragedy of declining loggerhead numbers because most of the nesting beaches and supporting habitat for this species lies under U.S. control. You are currently browsing the Turtle Journal blog archives for December, 2011.